All the back to school sales start in the US and we have found that WAL MART gives you the best deals. We can always use pencils, erasers, pens, colored pencils, the 24 count Crayons, Math and Alphabet flash cards, used books and rulers(plastic). One thing, if you are going to donate items it is best to get lots of one kind rather then one or two items. We try and give all the children the same thing. If you are planning to come over for a visit on one of our trips you can get the school supplies in August and save them till you come over. With 3,640 children we go through a lot of school supplies! Frank Wehmeyer (on left) presented this 46th SFCA recognition award to Jason Taylor of the Walmart Super Center in Benton Il. 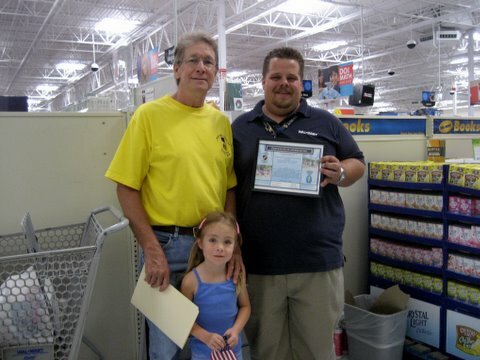 The Walmart Super Center gave a gift card earlier in the year. Stop by your local Walmart and ask them to do the same.